As I wrote earlier, the wonderful hotel employee Merce of the Hotel Semáforo de Bares set up a wonderful two days around the area of the hotel. Yesterday, she picked me up from the town of O Barqueiro to bring me to the hotel, from where I did a short walk to and from the most northern point of Spain, the Faro de Estaca de Bares. Today, she suggested that after checking out, she would drop me off at a beach to do a hike along the cliffs to the next FEVE train station, Loiba. It turns out that this hike is part of a much longer hike along the northern coast all the way from Ribadeo and As Catedrais beach. You can find a map of the whole route at the website of the Ministry of Agriculture, Fisheries, Food, and Environment (MAPAMA) (but careful, I get warnings that this site isn’t secure). The part of the hike that I did is a section of the brown squiggly line all the way to the left, below. …really, quite a stunning 5 minute walk that transported me to a very relaxed state. This path is the green line on the map below, and today’s walk started where the yellow arrow points, at the Playa de Esteiro beach. Here, Merce deposited me before heading home, and I felt like if I didn’t already have plans to go to Ferrol later that day, I could have just relaxed at this beach the whole day! Amazing, a secluded beach with no one but surfers, at the height of summer travel season. First the route went inlands a bit through a marshy area. All of the waters here, like the waters by the docks at O Barqueiro, were teeming with fish of all sizes. Then the route curved back around to the ocean, and started to climb up the cliffs. From here I got a better view of the surfers. Around here was a park bench, where a couple installed themselves, just looking at the view. Good idea. Besides that couple, I only came across one other hiker and a couple mountain bikers during this entire walk, until I got to “the most beautiful bench in the world” (more on that later). But seriously, I think that the park bench here really had the best views of all. Continuing to walk along the cliffs, there were stretches through pine forests and vegetation. And more ferns like yesterday’s hike. A slug slowly crossing the path. The rocks and cliffs here are just stunning. I also noticed that there are lots of hydrangeas around Galicia, too! The path continued back towards the edge of the cliffs, where there was a line forming to take a picture with a park bench. Seeing this line, I also queued up, and got my picture taken! Merce had explained to me there was a park bench known as “el banco más bonito del mundo” (“the most beautiful bench in the world”), and was quite famous, having appeared on the news and also in commercials for Ikea. She warned me that a previous guest had witnessed fistfights break out for a chance to take pictures with the park bench! However, after looking at my map, I realized a mistake. That wasn’t the famous park bench - I had to walk a bit further! At the next cove, I spotted another park bench, this one with the dubious translation “The best bank of the world” written on the back (in Spanish, the word “banco” means both bank and park bench!). So, dutifully I lined up to have my picture taken with this one as well! Although in my opinion the views from this bench were not as good as the last one, with the first bench looking out at the Playa de Esteiro the most spectacular of all. …where signs keep you oriented and on track. At this juncture, however, I left the Ruta del Cantábrico to head to the train station. This is a road open to cars, and I was afraid the walk from the cliffs to the train station would be full of traffic, but I passed just a single car on this first stretch. There was just a few minutes of walking along a busier road next to a church, before I found the sign pointing to the FEVE train station of Loiba. My next post will be about how to travel on the FEVE narrow-gauge rail, so stay tuned for that! A couple days later, I would start the Camino de Santiago along the Camino Inglés, departing from Ferrol. The Camino de Santiago is world famous, you get the benefit of having the camaraderie of other pilgrims, and at the end you get a nifty certificate from the church certifying your pilgrimage. But now, looking back at my time in the north of Spain, these were the most relaxing and refreshing two days of the holiday. 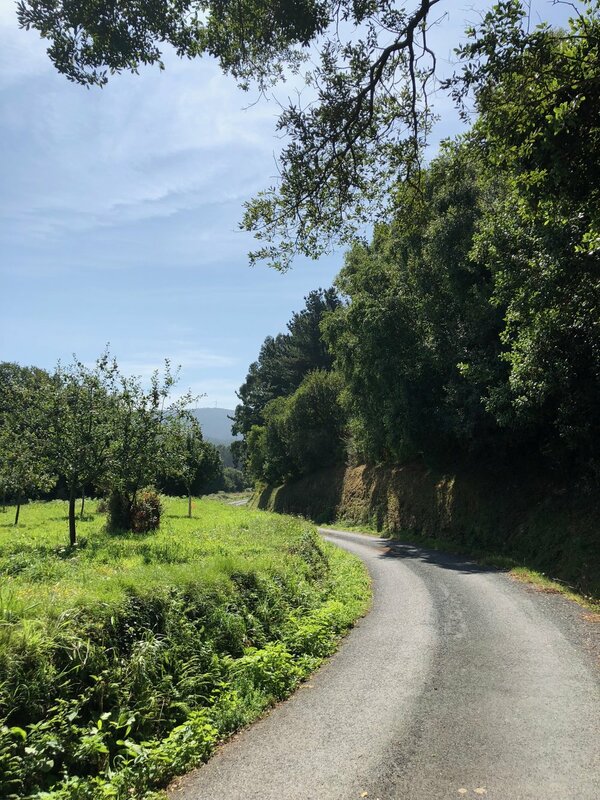 And the scenery along the Ruta del Cantábrico, at least the short sections I walked around O Barqueiro and Loiba, bested anything I saw along the Camino Inglés hands down. For a relaxing, mainly solitary hike along stunning scenery, I’d recommend looking into the Ruta del Cantábrico.